Killer work from Nino Ferrer – maybe his most soulful album ever, and one that’s filled with loads of hard-jamming funky cuts! Nino got his start in the beat sound of the 60s – but here, he’s working with arrangements by Bernard Estardy, ones that have a trippy jazz approach with lots of freewheeling guitar and organ, odd percussion, and some nice heavy drums. Although Nino’s vocals do appear on the album (and they’re great! ), a good portion of the record is dedicated to instrumental jamming and grooving – which kind of makes the set a double-headed monster – all the great soul of Nino’s late 60s work, with a funky instrumental side too! 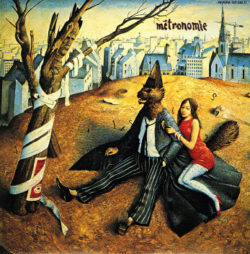 Titles include “Metronomie”, “Freak”, “Cannabis”, “La Maison Pres De La Fontaine”, and “Pour Oublier Qu’On S’Est Aimes”.